Mac Premo, b. 1973, American stuffmaker, whose hands on approach to filmmaking has created multi-tactile campaigns for the likes of Sprint, Ford, McDonalds and Budweiser. Mac graduated from the Rhode Island School of Design before initiating and participating in several public art projects in Belfast, Northern Ireland. He has won seven New York Emmy Awards for his video and animation work, including awards for best commercial, photography, set design and best public service announcement. In 2011 Mac created The Dumpster project where he completely collaged the insides of a 30 yard dumpster using discarded memorabilia collected over 20 years as the raw material. Mac’s unwavering mission to promote a greener lifestyle enabled him to turn trash into treasure when the World Wildlife Fund approached him to help raise awareness for Earth Hour 2015. 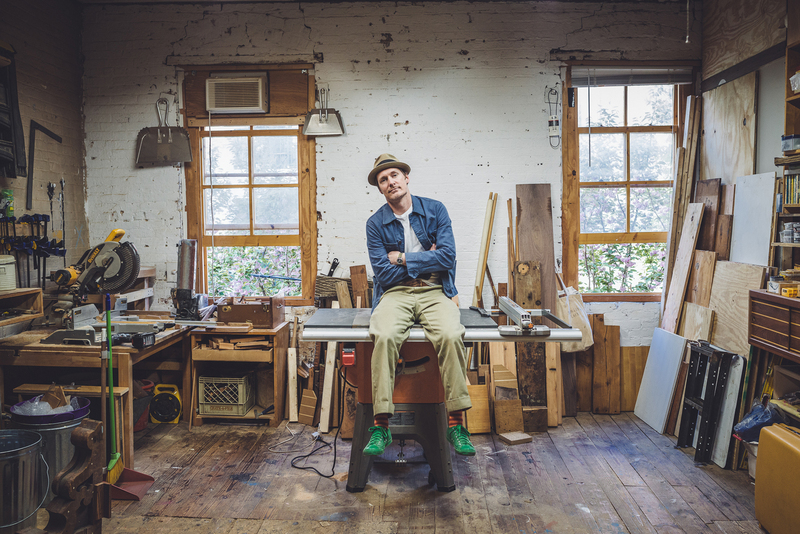 Teaming up with the talented craftsman behind Sandford Shapes, Mac created The Bucket Board – a skateboard deck constructed entirely out of recycled materials found in dumpsters and constructions sites. Mac continues to feed his passion for art, illustration, filmmaking, sculpture, painting and more. He lives in Brooklyn with his wife and their two totally radical daughters.